The story of Robert De Niro's father is now being told by his Oscar-winning son. 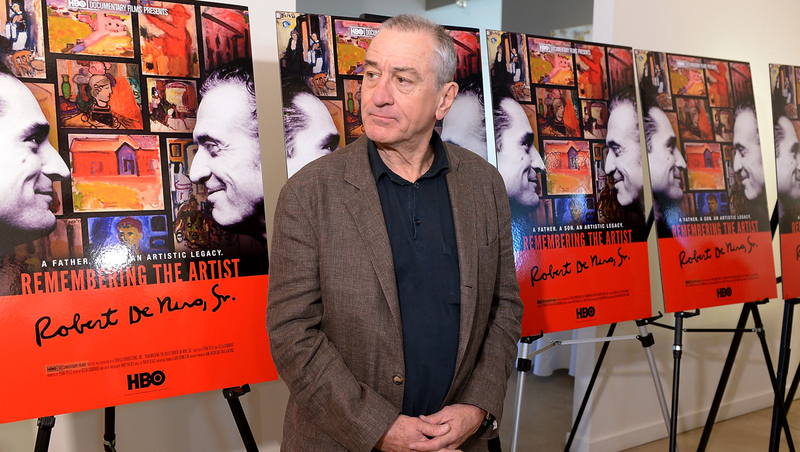 De Niro has made a documentary about his father, who died in 1993 at 71, called "Remembering the Artist Robert De Niro Sr," which premiered at the 2014 Sundance Film Festival and will air on HBO in June. He has also put some of his father's work on display at the Julie Nestor Gallery in Park City, Utah. Robert De Niro Sr. was an abstract expressionist painter, part of the post-WWII art scene, which produced such talent as Jackson Pollock. He was even endorsed by the famed art collector and socialite, Peggy Guggenheim. But while he was successful when he started out in the 1940s and '50s, De Niro Sr.'s work went out of style as pop art became the trend in the '60s. While attending a reception at the gallery on Sunday, De Niro said the intention was to make the documentary for his family. "(I) wanted to make a documentary about my father with footage, whatever footage we had; people, whoever was around that were still with us, (I) wanted to have them interviewed and talk about him and have it for the family, for my kids, the grandkids," he said. "And then it went this way that HBO picked it up which is really great." When asked what he thought his father would think of the film about him, De Niro joked that he would probably be uncomfortable by the attention. "He would be flattered on the one hand and say, `Well, I don't know, that's not accurate' or this or that," he said. De Niro says he tried to feature his father's art in his own work, like at his restaurant the Tribeca Grill in New York. "I asked him if he would let me hang some of his paintings there and I thought for sure he's not gonna, not gonna like that, but he actually went along with it. He hung them himself, especially the three big paintings in the back of the grill and I was told he'd bring friends from time to time like once a week or every 10 days or so to have dinners there," De Niro said. "And then I asked him if he'd do the menu and he did the menu, which is still there. ... It will be there as long as the place exists." De Niro is in town for the 30th anniversary of the Sundance Film Festival. The actor said he hopes his own film festival, the Tribeca Film Festival, which he co-founded with producing partner Jane Rosenthal after Sept. 11, will be just as successful. This year marks its 13th anniversary. "I hope we do as well as Sundance in 30 years, on our 30th anniversary."